In many large models, most of the geometry consists of objects that can be represented as an extrusion of a planar curve. Rhino 5.0 has a new lightweight extrusion object that uses less memory, meshes faster, and saves smaller than the traditional polysurface used in Rhino 4.0. Commands like Box and Cylinder create lightweight extrusion objects. Other commands like Pipe and ExtrudeCrv make lightweight extrusion objects when possible and make traditional polysurface objects when the resulting geometry is too wiggly to be handled by a lightweight extrusion object. Customers were creating architectural models with tens of thousands of objects that were simple extrusions. When traditional polysurfaces were used to represent the objects, the models were sluggish and used lots of memory resources. When these models use the lightweight extrusions, the models were responsive and there was plenty of memory available. The new UseExtrusions command can be used to control the use of lightweight extrusion objects. If you want commands like Box, Cylinder, Pipe and ExtrudeCrv to make lightweight extrusion objects, then run UseExtrusions and select the “Extrusions” option. If you want these commands to make traditional polysurfaces, then select the “Polysurface” option. 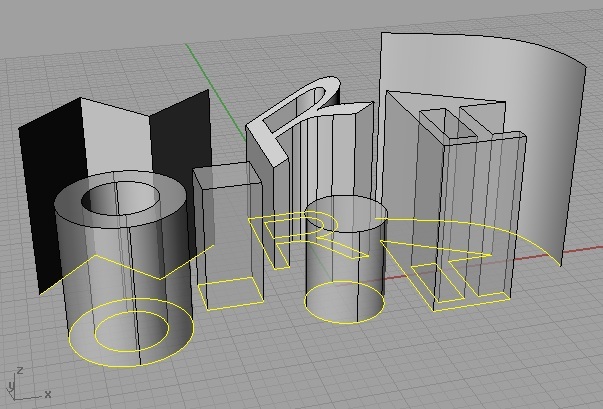 SelExtrusions: This command will select extrusion objects. It will not select polysurface or surface objects. You can use this command if you really want to see what objects are extrusions. ConvertExtrusion: This command will convert extrusions to traditional polysurface or surface objects. You can choose to either replace the existing extrusions or add the converted objects. SelPolySrf, SelOpenPolySrf, SelClosedPolySrf : These commands were updated to select extrusion objects that look and act like traditional polysurface objects. SelSrf, SelClosedSrf, SelOpenSrf : These commands were updated to select extrusions objects that look and act like traditional surfaces. ExtrudeCrv: These commands will create lightweight extrusion objects when possible. Box, Cylinder: These commands will create lightweight extrusion objects. Pipe, Slab: These commands will create lightweight extrusion objects when possible. Explode: If you explode an extrusion object, the result is the same as if you exploded a polysurface. Mesh: If you mesh an extrusion object, the walls are always meshed with quads running the length of the extrusion. The caps are generally meshed with triangles.